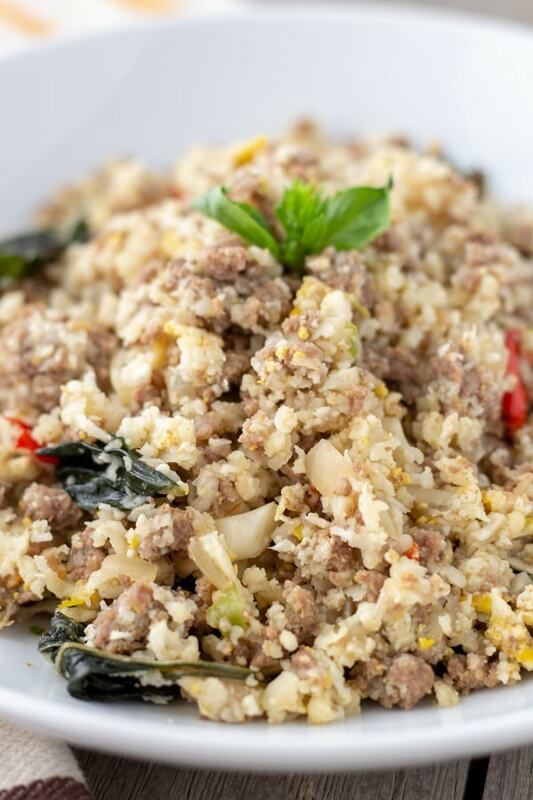 Cauliflower fried ‘rice’ turns into a complete meal with ground beef and Thai Basil. The flavors are similar to the Thai dish Kao Phat Kra Pao, but with fewer carbs are more nutrition. Anytime I can make a dish healthier without sacrificing taste, I’m all for it! 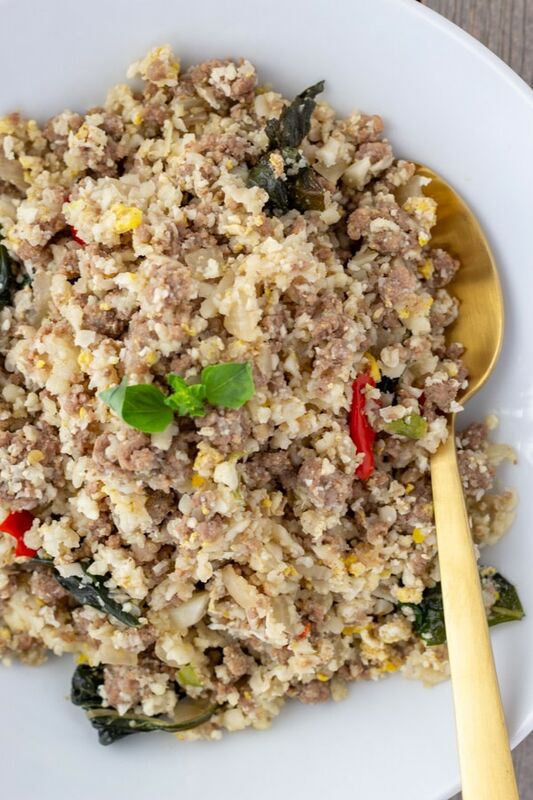 This dish is no exception, it tastes just as good as Thai Beef Basil Fried Rice, but fewer calories, carbs, and packs in more nutrition. If you haven’t jumped on the cauliflower rice bandwagon, then you definitely need to. It’s such a good alternative to rice if you want to cut back on some carbs and calories. You could make your own cauliflower rice by placing it in a food processor, but I love the convenience of packaged riced cauliflower. You can find it packaged fresh or frozen. The flavors of this dish are similar to my Beef Basil Recipe, but this is more of a one pan meal and made with ground beef instead. 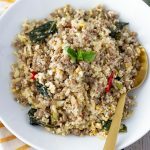 This Thai Beef Basil Cauliflower Fried Rice reheats well, so it’s a great option for meal prep too! This dish doesn’t photograph well, but I promise that it doesn’t lack in flavor. Adjust the spice level to your desire and you can have an Authentic Thai dish that is good for you. 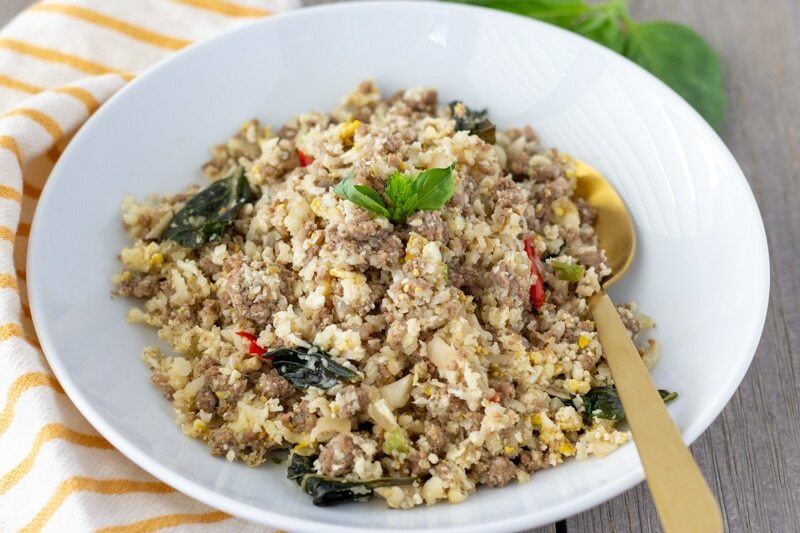 Cauliflower fried 'rice' turns into a complete meal with ground beef and Thai Basil. The flavors are similar to the Thai dish Kao Phat Kra Pao, but with fewer carbs are more nutrition. Marinate the ground beef with 1 tbsp of soy sauce and mix it well. Set aside and prep the remaining ingredients. Dice half an onion, set aside. Pound chili's and garlic together to form a paste. If you don't have a mortar, you can finely chop them. Rinse and dry about 2 cups of Thai basil leaves. Add oil to pan and saute the onions, garlic and chili over medium high heat. Then add the ground beef and cook thoroughly. Push everything to one side of the pan, add a little more oil and crack 2 eggs into the hot oil. Give them some time to set, then mix in with the other ingredients. Add cauliflower rice, along with soy sauce and oyster sauce. Cook for a couple minutes until rice and vegetables become tender. Turn off the heat, add basil, and stir till it becomes wilted. Taste and add salt/pepper if needed. If you're in a pinch and can't get Thai Basil, then you can substitute Italian Basil.